So I'm not entire sure where the inspiration and desire for making Huevos Rancheros came from - but I had a few sources of inspiration. I know that I watched them make it on Cut Throat Kitchen - and it stood out for me because the one chef was baffled because they had no idea what the dish was. But then of course the wonderful Alton Brown provided a bit of an explanation and I knew in that moment it would be something I would want to try and/or make. My limited understanding of the dish is this: it is basically a popular breakfast dish of Mexican origin or inspiration comprised of eggs (see Wikki for more info). So because it is not a specific dish in of itself but more a style of dish it made making the dish very interesting. Now if I had bothered to be thinking a little more (again this was late night cooking so brain not entirely functional) I would have checked the fact that I had a recipe flagged in one of my books books. Nonetheless I set off with a general idea in mind. I knew that I was going to serve a fried egg on tostadas - which by the way are incredible easy but difficult to buy. (I had to search through a box to find a bag that was not broken and then had to treat them like babies on the way home ...) From there I googled...yes - let's not get into that - what traditional Mexican spices were so I could get my flavour profile. With the results showing that common flavours are cumin, coriander, chile powered and oregano I figured I knew what I wanted to do. The first thing I did was cut down my meat into smaller pieces. Now I used stewing beef which was a bad choice in the long run as it was too tough next time I would go for a nicer stake and cut it down. I then made a quick marinade for the meat - half the juice of a lemon, half the juice of a lime, two minced garlic cloves, fresh cilantro, cumin, coriander and oregano. 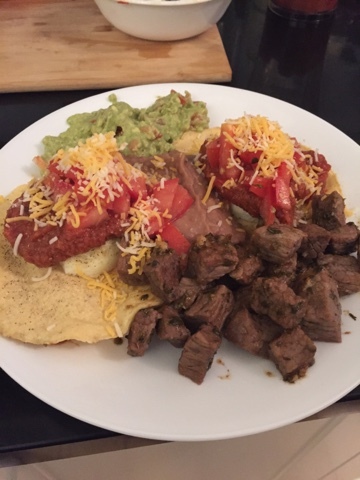 I tossed the meat and set it aside while I prepared the guacamole. I used two smaller size ripe avocados (which I now know how to properly select, ripen and then store thanks to Good Eats! ), mashed those with the remaining juice from the lemon and limes, added some chopped garlic, salt and cumin. The result was amazing. I will admit given the time of night that this was happening and my overall tiredness I got a little lazy and I did use store bought salsa, refried beans and tostadas. However, the next time that I make this I hope to be able to pull everything off from scratch!